It is done. I have completed my book on adaptogens. Adaptogens are plants like Eluthero root, Ginseng, Rhodiola, and Schisandra. These plants have been shown to have nutrients that assist the body in recovery and times of stress. My book explains how and why they work. 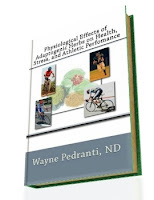 I am offering Physiological Effects of Adaptogenic Herbs on Health, Stress, and Athletic Performance to all 53X11 members and blog readers at a 15% discount if they purchase direct from the publisher. You can purchase the book here and use the code XE27K2LN to get the 15% discount. If you prefer, this book is also available to order from Amazon as well as regular book stores.Sorry no discount there. The last Pacific of the year was held on August 30th. I had to do it if I wanted to qualify for the goodie give-away afterwards (killer cupcakes too). It was a 40 minute affair held on the flat course. I have been struggling mentally for the last 4 weeks (won't go into details but it is the toughest challenge I have faced, and it is all my fault), and my training really has been nil. I have ridden almost every day, but only easy stuff. As the 4/5s rolled out, Rory, the director and a friend, looked at me and said "and I wanna see you out front." Our start was so pedestrian I took him up on the challenge and got to the front of the pack on the back stretch and then attacked. I never attack there. One guy joined me but said he was covering attacks for a teammate and couldn't work with me. We had a nice laugh and rode a steady tempo waiting to get caught. Well another guy went off the front and my companion joined him. I was caught between those two and the pack so went all out to catch the break. We were caught just before the start/finish and I attacked again even though I was way in over my head and my legs and lungs were screaming.. I knew I could not keep it but was way off the front as I passed Rory. I pointed to him and yelled "This is for you!" 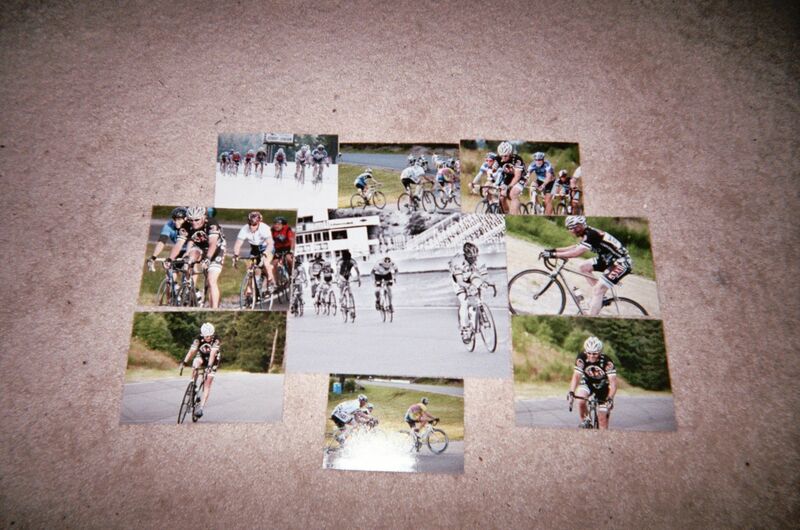 I was soon caught as the pack was flying as the 2nd lap was a prime lap. I ended up getting a 1/2 season pass for 2012 for volunteering at a recent triathlon managed by Rory and his wife. I also got 2 new tubes, a lot of GU, and a nice pair of Axley sunglasses. Not bad for only doing 10 races. I CANNOT wait for 2012. Last night I tried something new-a spin class. My girlfriend and I discovered a tiny little studio ("Pons Studio" or http://www.ponsstudio.com/) tucked into a small strip mall only a mile from home. I have not been a big fan of spin classes, and tried one several years ago in Washington, D.C. It turned out to be more of an "aerobics in a saddle" class and I got into some arguments with the instructor as I just wanted to ride. Anyway, Pons Studio is run by Francisco Pons, who is a racer himself. He also is a Level 2 USA Cycling Coach. My girlfriend and I walked by the studio one night when class was in session and I was intrigued by the bikes. They are called Realryder (http://www.realryder.com/), and are stationary but also mobile. They move much like a real bike and you can get out of the saddle and sprint or simulate climbing. These came with toe clips or spd pedals (perfect for me as all my cycling shoes are spd). Tension is adjusted by turning a knob on the top tube and the saddle and bars are adjustable. I received one free class so went last night, which felt odd as it was so beautiful out. I would have preferred to be riding outside but I did get to ride to the studio. There were four of us, 3 men and Francisco's wife. The bike was very easy to get used to and I was soon having fun. Class started and Francisco cranked up the music and led us through 60 minutes of intervals, tempo, climbing, turning (these bikes lean). I had a real blast and will definitely go again (but on lousy weather days). Anyway, check out realryder. It is a very cool concept. Last night at my 8th Pacific I had snap in my legs, so unlike the previous week. Maybe it was smelling the barbeque before the start. BUDU Racing, the sponsors of the weekly races, always does a bbq near the end of the season. It is always a fun way to celebrate the racing and family atmosphere. Due to the bbq we only raced for 30 mins, about half of normal. We were to race the flats with points per lap, but due to an accident on the drag strip we had to change the course to the lounger (and more fun) "down the escape ramp." We started on the flats on top, headed west for almost a mile then turned back to the east and down a short steep straight ramp to the bottom of the curving uphill rollers that put is back on the top. There were about 30 riders in the 4/5 race, and before the start we were asked to go down a few hundred yards on the flat and sweep the course and clear it of all the rocks and debris kicked up earlier by a lawn mower. It felt good to do our part. But 3 of us almost missed the start and rolled up just as the group was leaving. I felt so strong on the climbs and had no issues staying with the group. As we started the second lap I was at the back with a friend and asked if he wanted to attack with me. So I led us up the side and gave it 110% . But eventually I looked back and saw the pack strung out. They wouldn't let us go. A crash occurred about halfway into the race on the small cimb but I was able to get around it and chase back. But oh what a fun race! And the hot dogs and coke were delicious! Today marks my two year anniversary of being a single speed rider. It was two years ago that I purchased a 54cm Specialized Tricross single speed cross bike off ebay. The seller was the parent of a very good junior rider in Kansas City and I bought the bike for a steal. My low bid was the only one. Both myself and the seller were surprised I got the bike for such a low price, especially considering that the bike was signed on the top tube by Tim Johnson. I quickly discovered that 44x17 was the perfect gearing for me. I live in a hilly area and this gearing gets me up many of the climbs, and I can crank on the flats. In the two years I have logged 2921.5 miles on her and she has become my mainstay training bike and tt bike. I cannot sing the praises of single speed riding enough and encourage everyone to get one.